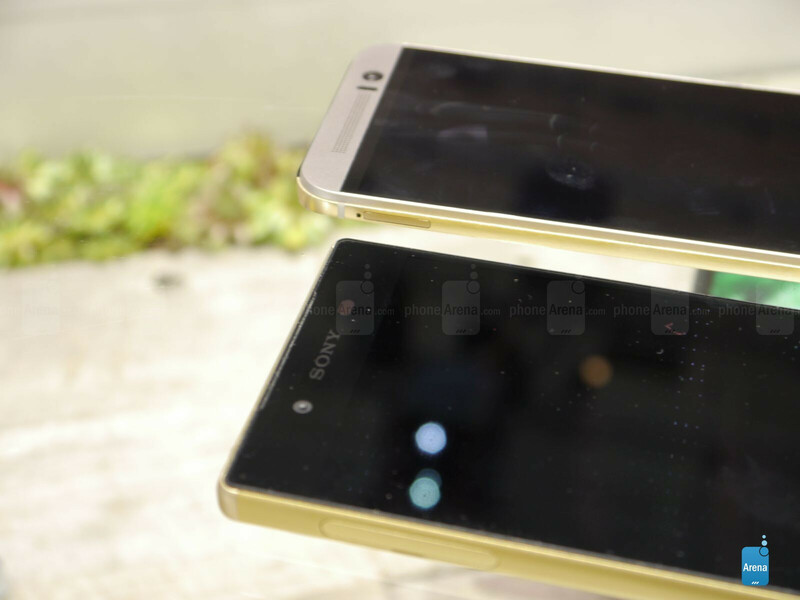 The Sony Xperia Z5 could be considered one of IFA 2015's superstars, together with the Samsung Gear S2 and strong devices by Huawei and Lenovo. We love comparing hi-end smartphones here at PhoneArena, for they represent the best of a given company's abilities. One such smartphone is the HTC One M9, the all-metal flagship from Taiwan that's bound to steal some looks away from the Z5 at the store. 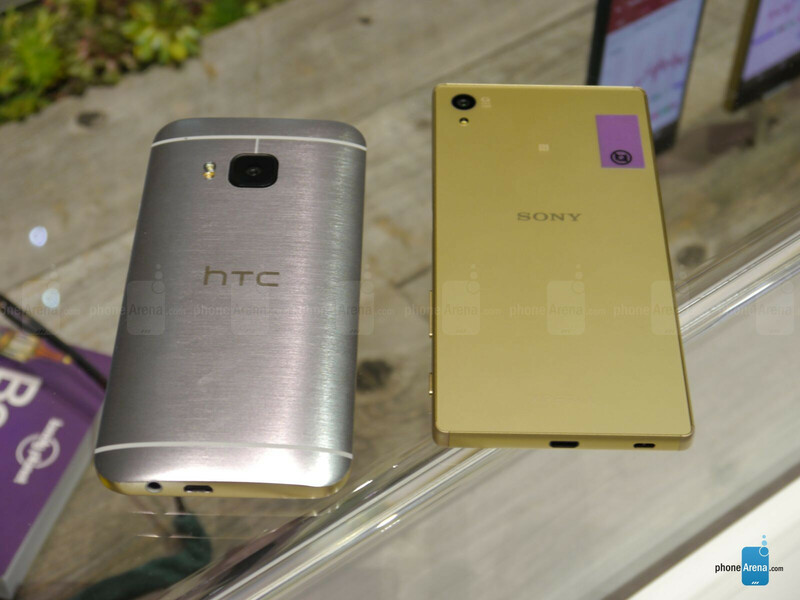 The Sony Xperia Z5 and HTC One M9 showcase some of today's finest smartphone craftsmanship. But whereas the Z5's metal unibody is sandwiched in frost-finish glass, the One M9's is all polished metal, with glass only to be found covering its display. With "unibody" present in the picture, it goes without saying that removable batteries are out of the question, although Sony and HTC didn't go all Samsung on us by cutting the microSD card slot. Notably, the Z5 is also water-resistant, continuing the Sony Xperia flagships' tradition. Both smartphones have their power and volume keys positioned on the right side, with the Z5 featuring a dedicated camera button. The One M9 doesn't have that, but the volume buttons can be configured as shutter release or camera zoom buttons. Another thing the two have in common is a pair of stereo speakers. Dimensions-wise, Sony's flagship measures 5.75 x 2.83 x 0.29 inches (146 x 72 x 7.3 mm) and weights 5.43 oz (154 g). The One M9 is more manageable, but considerably thicker and slightly heavier at 5.69 x 2.74 x 0.38 inches (144.6 x 69.7 x 9.61 mm) and 5.54 oz (157 g). With these dimensions, both smartphones are rather big and tall, making hopes of one-handed operation a bit delusional. 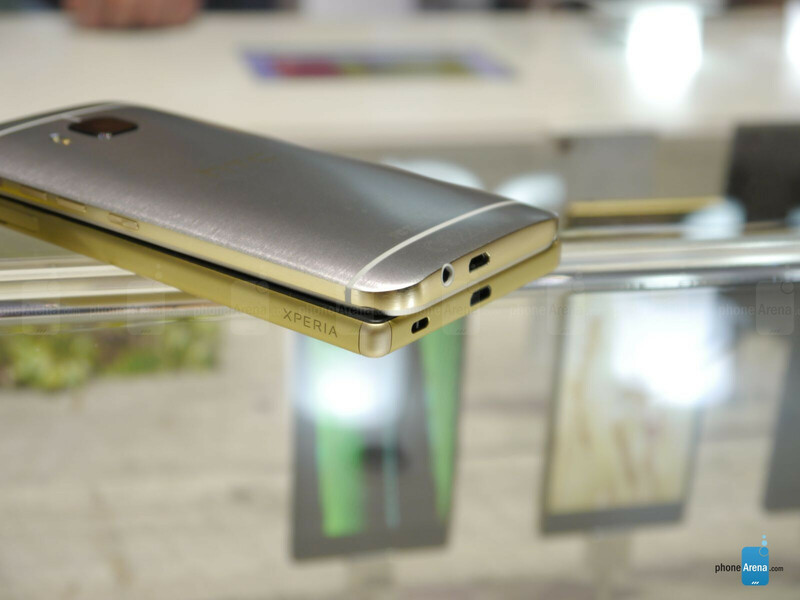 The One M9's display is another fine example of modern day IPS LCD technology in action. It's a manageable 5 inches in size, with the same 1080p resolution and about the same 441ppi pixel density. HTC isn't as obsessed with display technology as its contemporaries at Samsung, LG, and Sony, so there are no special display modes to choose among. It's an effective display, visible under bright sunlight and tolerable in darkness, but rather color-inaccurate. Very well, then! Both the Xperia Z5 and the One M9 are Android Lollipop devices, but the similarities in their user experience are few and far between. The Xperia UI goes for a straightforward "stock Android" feel with some proprietary apps, widgets, and services stacked on top. HTC's Sense UI is much more of an original creation built upon Android, but what it has in flashiness isn't sacrificed in streamlining. Essentially, both interfaces are very simple and intuitive. Homescreen editing is a breeze with easy options to add, remove, or change pages, widgets, apps, wallpapers, and themes. The multitasking key brings up the current apps in memory in the Lollipop card-based swipe format, but on the Z5, you also get the ever-useful Small Apps suite, which accomplishes basic multitasking by means of apps contained in small, resizable floating windows. HTC Sense doesn't have this much of a productivity fetish, but it's otherwise a very polished, modern, and fluid interface. 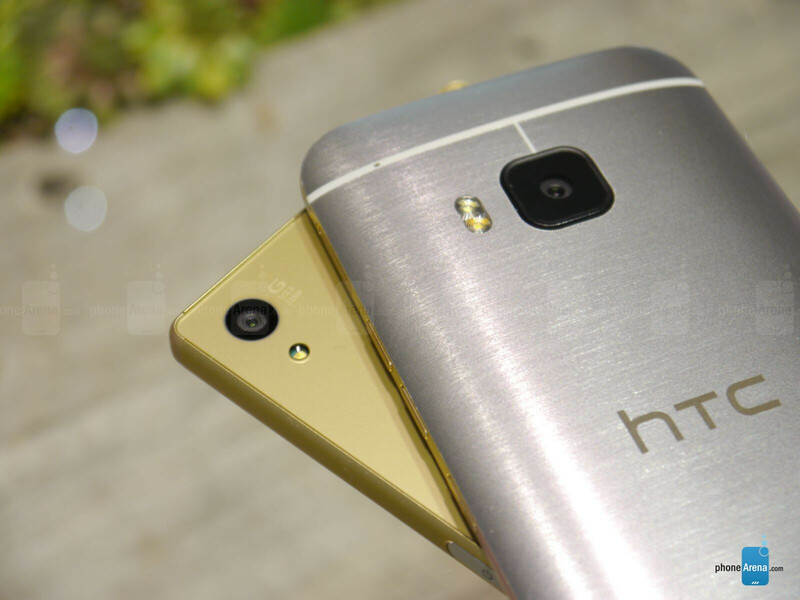 Sony and HTC's flagship smartphones have mostly identical hardware powering them. They work on the back of Qualcomm's current hi-end platform, the Snapdragon 810 SoC, paired with 3GB of LPDDR4 RAM and the Adreno 430 GPU. This configuration shows its best during short (think 15-30 minutes) bursts of gaming. The Adreno 430 is a powerful graphics unit capable of handling elaborate 3D graphics, but combined with the less than efficient Snapdragon 810 CPU, it generates quite a bit of temperature that needs to be gotten under control via aggressive CPU throttling. Storage-wise, the One M9 and Xperia Z5 are being sold with 32GB of expandable storage. If that's not enough for you, pop a microSD card in and let her rip! Both the Sony Xperia Z5 and HTC One M9 play the high megapixel count game, coming in at 23MP for the Z5's rear cam and 20MP for the M9's. The former is made by Sony, while the latter is a creation of Toshiba and is notable for its use of square-shaped pixels that are supposed to be soaking in some more light. On the front side, the Z5 comes with a 5MP cam, while the One M9 features a 4MP UltraPixel snapper. While we're working on a proper photo quality comparison between the two smartphones, we'd like to point out that their camera apps are some of the finest in business, with a plethora of shooting modes and sleek interfaces being their main points of interest. The Xperia Z5 comes with a single LED flash, while the One M9 has a dual-LED system happening. Both handsets are capable of recording 4K (3840x2160) video and come with digital image stabilization algorithms. They also have RAW image capture on tap for all the image editing enthusiasts out there. So, the Sony Xperia Z5 has mostly the same hardware as the Xperia Z3+, and comes with about the same 2900mAh battery unit (the Z3+ has a 2930mAh battery). That can't be good news for battery longevity, as the Z5's predecessor posted the worst battery test result out of all the Xperia flagships we've tested through the years. At 7 hours and 15 minutes of constant on-screen use, the Z3+ still racked up a better result than most of this year's hi-end smartphones, including the HTC One M9 and its middling score of 6 hours and 25 minutes. The Xperia Z5 may or may not be the finest Xperia smartphone to date, and this largely depends on how well Sony managed to optimize the Snapdragon 810 for the Xperia Z5. If its performance and battery life are anything like the Xperia Z3+, we won't be so keen on awarding it such a prestigious title. However, even if so, the Z5 can comfortably spare with the HTC One M9 in terms of speed, battery life, and multimedia potential. Poor HTC One M9. It exists just to make other flagships better :) Not that its bad. They failed to deliver it at the flagship level. I was loyal to HTC for the last 7 years but I could not make excuses about the camera any longer. I really tried to give them a chance but the M9, compared to the M8, made no sense and after seeing some of the pictures I took in Europe on the M8, I decided enough was enough. I went with the Samsung S6 Edge+ and I like the phone. The grand battle of two Ovens! Enough with this bullsh*t already, complaining is all you can do. They said that the z5 was able to record 4k video for several minutes before running hot but apparently its too difficult for your tiny brain to register this fact. So don't complain if you don't know something. Find your chill guys, I'm just poking a little fun out of what history has already proven :D jeez..
You sure you know anything about the 810's overheating issue, douche? Yes I do, and also it ruined many flagships this year but they have been working on the issue. Also in z5 they applied thermal paste and tubes to eliminate heating. You aren't the smartest one here are you? Mr. Bezels, can you explain further what's the problem with the Z5's bezels. As far as I know the Z5's screen to body ratio is 69.6% which is too close to the galaxy S6's 70.7% and better than the iPhones 6's 65.8%. I only quote those too phones cause they're most famous and most people buy them and don't complain... Furthermore, the Z5 packs front stereo speakers, an sd card, and an ip certification. So, if am not mistaken, maybe Sony has the upper hand when it comes to bezels. Rectangular slab. That pretty much sums up the design. Do you want a triangle? Ain't every phone a rectangular slab? Nope. Sony said back in April that they might include RAW capture in future devices if there was enough demand, but it hasn't happened.